These wreaths are so easy to make and feature an heirloom hand stitched look and echo stitching. Each wreath uses 4 quilt blocks that can be made into pillows and even full quilts. Use frosted fabric and tonal thread to complete your floral wreaths. 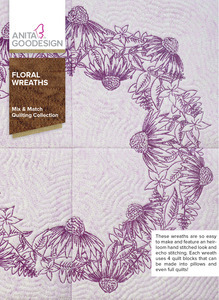 Each floral design stitches quickly in a single color, framed by tone-on-tone echo stitching. Each wreath is created using 4 unique designs which piece together to form a full ring of flowers. 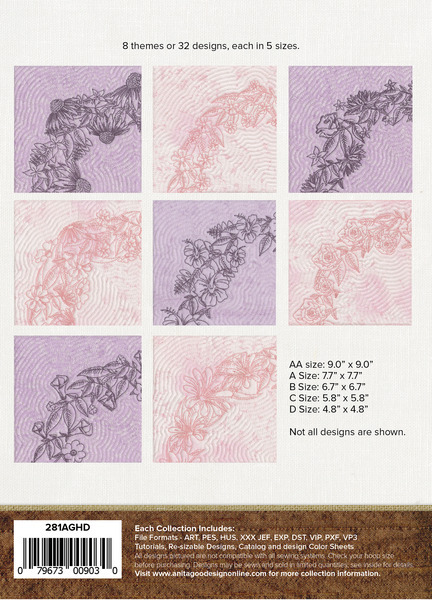 There are 8 different flower varieties included in this collection, for a total of 32 designs. 8 themes or 32 designs, each in 5 sizes.